This piece includes information on planning and getting to the Carrizo Plains National Monument, details for recreation opportunities, some recommendations for your visit and camping availability. All images copy-written, with use of images only permitted conditionally via written permission. There are super blooms and then there are super blooms. The Carrizo Plains is an example of the latter. I hadn’t visited the plains before and an urgency landed out of the blue, suddenly and all encompassing. I found a friend of a friend’s cell phone images and they stopped me while I was preparing a meal, they stopped me from doing anything other than glare down at the handful of photos, wild-eyed with internal cranks setting into motion. “I need to go here tomorrow. Today. Right now.” Right now, of course wasn’t going to happen. It was 8pm, the flowers were asleep, but that didn’t stop me from plotting. I began filling up water bottles, getting Cliff Bars and snacks loaded in my car, checking batteries and cleaning lenses. I knew I had to get out there. Wildflower blooms are like fireworks, they last with spectacular fleeting lifespans. Great blooms leave the world within days of arriving, sometimes never witnessed again in a lifetime. The Anza Borrego super bloom is already over, drying out and succumbing to desert entropy. That sort of urgency is all the motivation I require. I set out the next morning at 11am, drove the 58 east through Santa Margarita, stopping periodically for photograph opportunities. The 58 is a drive I encourage everyone to take. 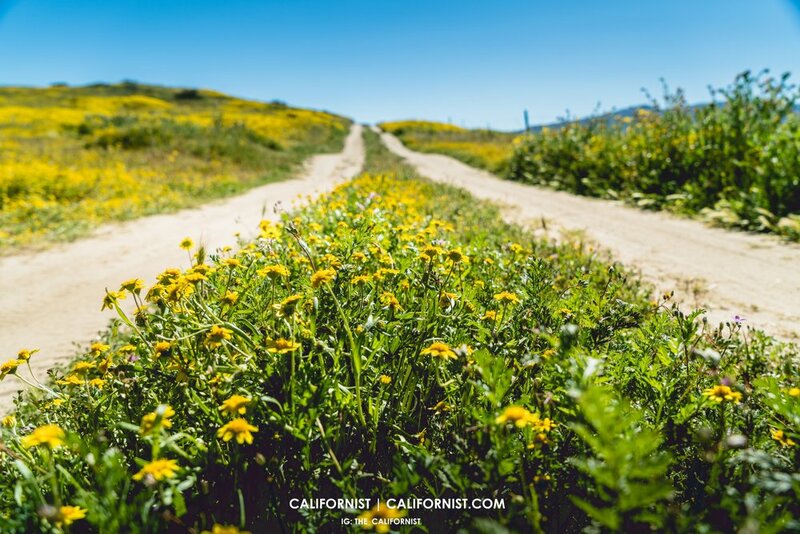 There are closer proximity (to the coast) blooms within intimate valleys between San Luis Obispo and the Carrizo Plains, people were out there in surprising mid-week hordes, picnicking and romping through the floral beds. Though the coup de gras, the Shangri-La, is the plain itself. To see and smell something as spectacular as this sensory amusement park makes you think of people who can’t go here. People like my father and mother, both of whom were wildflower fanatics. Their spirits are undoubtedly there already. So go. Go today. Go now. Leave work. Leave class. Just go. Behold one of nature’s most outstanding spectacles. If you live anywhere in California, there's basically no easier place to travel to than the Carrizo Plains National Monument. The park is sandwiched between two east-west running freeways, State Routes 58 and the notoriously dangerous 166, both of which are accessible by interstates US-101 and the US-5. I live on the central coast, so I drove north and took the 58 eastward, because it's a splendid and beautiful drive on a two-lane highway which weaves through the back-country of San Luis Obispo county. The Carrizo Plains are located within the County of San Luis Obispo, the farthest extent of the county line, just brushing the odd city of Taft and Kern County. Along the 58 were a few smaller, but also significant wildflower blooms. I think most people coming from the coast stopped at these intermittent blooms instead of making their way completely to the Carrizo Plains. Dozens of vehicles were parked along various wildflower beds on the route, lots of picnicking folk and children playing in streams and wandering the floral carpets that extend acres upon acres. It was a beautifully cinematic scene to witness, honestly. My GPS did a great job of routing me to the Soda Lake Road, which is contained within the National Monument. Soda Lake Road bisects the park down the middle and has several roadway spurs where you can park and do short walks onto the Soda Lake Overlook and boardwalk. Both walks I recommend, bring snacks and a picnic and enjoy the spectacular blooms from the overlook while you watch the gorgeous Soda Lake before it dries out again indefinitely. At the time of this writing, Soda Lake still holds water; though most of the year if not most of the time, the lake bed remains dry, arid and caked with the white calcification and salts. Continuing south on Soda Lake Rd, a branch takes you to the visitor center, which was closed when I was there, but is open seasonally from December 1, to the end of May, Thursday through Sunday, 9:00AM to 4:00PM. Maps are available at the front door when the center is closed--which is something I wish I had known, instead I snapped a cell phone image of the posted map on the kiosk (works like a charm). You can also purchase a permit for a self guided or BLM guided tours to Painted Rock, depending one when you arrive in the park. As of right now, the only way to tour Painted Rock is via BLM guided tour. Check out the BLM page on the Carrizo Plains regarding unusual closures (e.g. : Panorama Road) weather, camping and permits. If you have the time, I recommend taking Soda Lake road from the North Entrance all the way to the South Entrance (or vice-versa) to not only get a true feeling of the grandiose solitude this monument offers, but also to see if the blooms are more concentrated and varied in other parts of the monument. Wildflower blooms are far from static, they change all the time and their whereabouts varies considerably with concentration and floral types. I found concentrations to be more significant the farther south I drove. Massive pools of yellow and contrasting purple beds extending for acres in all directions. The true authority, in my opinion, on tracking wildflower blooms and finding out when and where the peaks of the season are is the Theodore Payne Foundation - Wild Flower Hotline. The foundation is a much-praised non-profit that offers weekly wildflower bloom reports, this link takes you to the listing of weekly reports where you can click-open regularly updated PDF documents that track the latest and best blooms throughout the state of California. Just scroll down the page to the latest report, which should be at the top of the listing, open the PDF link and start planning your trip. As my botanical knowledge is still in its early phase, I'm going to refrain from guessing the species of these flowers in my images and defer to the fine fellows at the Theodore Payne Foundation. I highly encourage you to donate and support the foundation - it's tax deductible! If you happen to know the species with certainty, please comment at the bottom and let me know. A kaleidoscopic floral bed, like a Monet painting. Established Campgrounds - KCL and Selby Campgrounds. All established sites are available on first-come, first-served basis. No reservations taken, so get there early during the busy spring season. There are two improved campgrounds found within the monument, the KCL Campground with 12 sites (2 ADA compliant), vaulted toilets, picnic tables, you know the drill here and also Selby Campground which features 13 sites with fire pits, vault toilets and tables, etc. Carrizo Plains also allows for dispersed camping, which means car-camping, or hiking in with a tent, or horseback. This is my kind of camping, though you really need to be prepared. You have to dig cat hole for your bathroom, bring your own water, haul out everything you bring with you. To find out where you can do dispersed camping, the BLM has a great Visitor's Resources Map. Basically, you can disperse camp on any of the foothills, but not within the basin/plains -- this is a good thing as tents would blight the views.